The government is launching a trade challenge against Ontario over unfair liquor policies that prevent Alberta manufacturers from accessing the Ontario market. 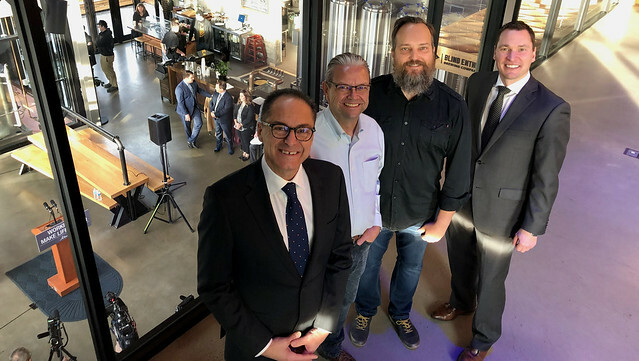 Minister Joe Ceci and Minister Deron Bilous are joined by Alberta brewers Neil Herbst and Greg Zeschuk to announce support for Alberta's small brewers. Alberta lists 3,700 products from other parts of Canada, including 745 from Ontario. By contrast, Ontario imports only about 20 Alberta products despite their market being three times as large. Meanwhile, Alberta products are readily sold in Japan, the United States and across the European Union. Alberta also maintains the most open liquor market in the country, with more than 20,000 liquor products available for purchase across the province. In addition to the trade challenge, Alberta is introducing a universal small brewer markup. Brewers who apply for this markup and produce less than 50,000 hectolitres in Annual Worldwide Production (AWP) will be subject to less than the standard $1.25 per litre markup. A markup of between 10 cents and 60 cents will be applied per litre based on their AWP. The lower markup rates will allow small brewers to reinvest in their business and continue to grow. Alberta now has 137 liquor manufacturers, including 99 brewers. The number of brewers in Alberta has nearly tripled since the government introduced the Alberta Small Brewers Development Program in 2016. The markup rates will come into effect following the cancellation of the Alberta Small Brewers Development Program on Dec. 15. Production and sales counting towards the program will continue to be eligible up to the program’s cancellation. Additional measures to support Alberta liquor manufacturers will be announced in the coming weeks. There are 99 small beer manufacturers in Alberta. The discounted small brewer markup is open to all brewers producing up to 50,000 hectolitres of Annual Worldwide Production (AWP). Brewers with AWP of more than 50,000 hectolitres will continue to have the standard markup of $1.25 per litre applied to their product.